There are often fan-shaped patterns showing the directions that more sensitive telescopes with modest fields of view are pointed. 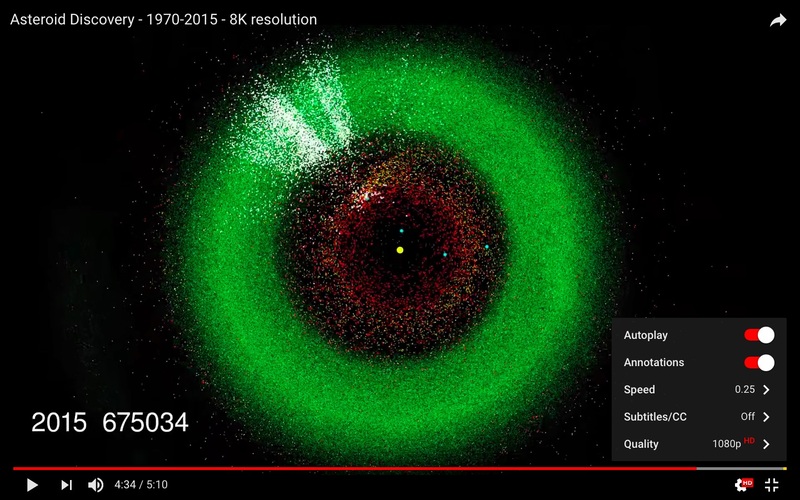 However, I noticed that only during the year 2010, roughly between asteroid numbers 500,000 and 520,000 there are radial striations at certain distances from the Sun. I don't see this happen at any other time during the video. Is this just a rendering artifact, or is it real? If real, what would cause the periodic radial modulation of sensitivity, and only in 2010? note 1: YouTube allows for playback rates between 25% and 200%, and variable video resolutions. I found 25% and 1080p optimal for my current internet connection and screen. note 2: For those with GIFs disabled, one image is a GIF. 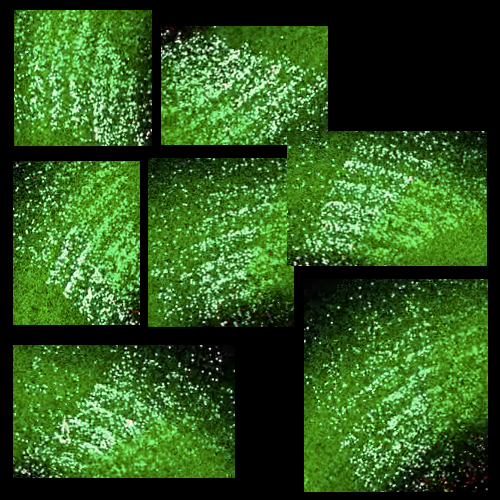 note 3: 2nd image contains several cropped screenshots highlighting the "periodic radial modulation of sensitivity" in asteroid detection during 2010, for clarification purposes. I'm pretty sure that the radial pattern found in the data is a result of WISE's approximately 90 minute sampling cadence (dictated by the satellite's orbit), astrometric precision (about 0.2 arcseconds in the stacked images around launch, see Wright et al. 2010), and the number of free parameters in fitting the asteroid orbits based on that data. See, in the actual images the asteroids appear as points of light that shift appreciably between frames. IIRC, they expected 7 to 12 observations per asteroid. So you have 10-ish observations spanning 15 hours or so to fix the asteroid's orbital parameters around the sun. 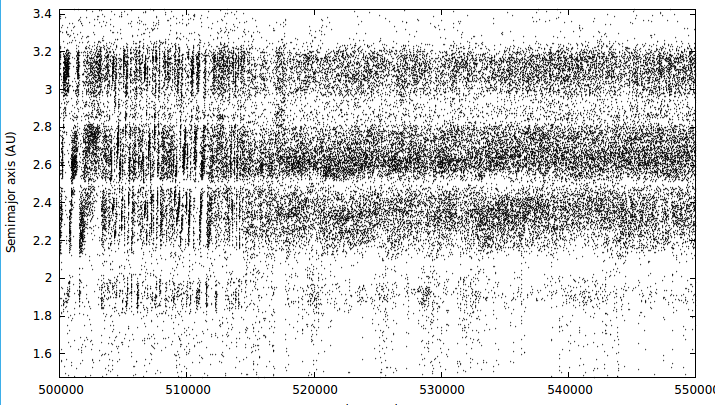 As you can imagine, there will be more parameters than can be perfectly fit with a single pass in this data set alone. At a guess: it's related to quantization in uncertainty estimates and how that feeds forward into the orbit fitting algorithm. I don't know the details behind the striping, but I'd bet it's related to the numerical precision used in the early processing of the data. They've either refined the orbits since using observations from passes separated by ~6 months, or modified how they're handling the numerical precision in their astrometric measurements since. More likely the former, but I'm sure if you asked Amy Mainzer (PI of NEOWISE, and head of the asteroid hunting part of the mission), Roc Cutri (head of the database creation and data processing part of the team), or any of the people on Mainzer's team, they could tell you more. Relevant background: I was Ned Wright's grad student (original PI of WISE), and he had me design and test an asteroid hunting algorithm in the run-up to launch (we ultimately didn't use it - it scaled like $N^2$, IIRC, and existing efforts in the literature scaled like $\log(N)$ or $N\log(N)$). I ended up working with the extragalctic part of the team, hence my uncertainty on the precise details of what the solar system team did. I think I asked them about the striping during a presentation, but I don't recall the answer, so I'm pretty sure the answer was mundane and unavoidable. Answer based on a misunderstanding of the question, left here because it contains some useful background on WISE. The pie-shaped patterns starting in 2010 are results of the WISE mission (see the video description). The radial pattern within those pie shapes is not explained by my answer. NASA's Wide-field Infrared Survey Explorer (WISE) is a space telescope launched in 2009 to map the entire sky in infrared wavelengths. WISE imaged the entire sky twice before running out of coolant in 2010. 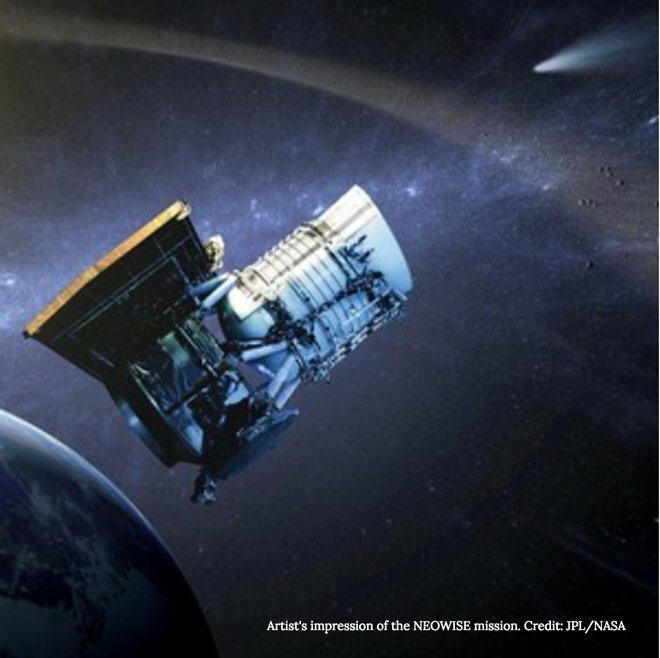 It then did a brief mission called NEOWISE, to look at near-Earth objects (NEOs) such as asteroids and comets, for four months before being placed into hibernation in February 2011. Less than three years later, in December 2013, the telescope was revived to continue its NEOWISE mission. That work continues today. you can see the telescope is perpendicular to the solar panels, so it'll tend to look at objects perpendicular to the Earth-Sun line, which causes the bright bands you see in the video. For what it's worth, I tried to download the newest astorb.dat and plot it, but couldn't see the effect there. So it might very well be that the 2010 asteroids were based on preliminary WISE data and weren't all that accurate, and the later videos have not updated the old animations. Not the answer you're looking for? Browse other questions tagged asteroids or ask your own question. How much did we know about asteroids at the beginning of the 20th century? Why don't planets and asteroids have (cometary) tails?